I rescued a 48 case oak Hamilton ccabinet with over 50 type cases. I can’t use it and would like it to go to a good home. I have three choices; Give it away as is-ASAP, or should I refinish it and sell it. I see them going for as much as $3,000, or sell it as is. Does it lose value refinished? I am 35 miles north of NYC, any takers? I offered the cabinet to a local friend and he is happily going to put it to use in his own shop. I am still interested to know whether it is worth more in clean but original condition or refurbished. As someone who trawls eBay and other auction sites frequently, I do see them listed at $3,000 quite often, but I don’t think I have seen one sell for its asking price in that range. In fact, there are a couple of large cabinets listed on eBay right now that have been up for months, slowly going down in price from their original 3k+ prices. Now, I’m sure it happens from time to time, if an interior decorator with a budget is looking for one, but there aren’t that many printers that need all that metal-type storage, I guess. Also, I see wooden ones in good condition and 48 matching cases go for less than a grand all the time. Wouldn’t refinishing one of these be a lot of work? 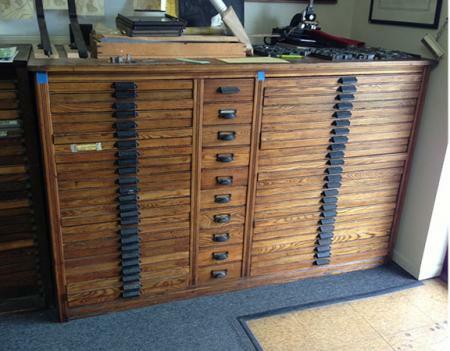 I would be interested in buying a Wooden Hamilton Printers cabinet of around the 48 case size. If you know of any that may be available. Where are you located SKieva? Barbara, the nicer ones do tend to be priced high and not sell. Usually on the east-coast it seems. Live in North Jersey and am looking for a Hamilton printer’s cabinet. i have one of those east coast cabinets for sale. i have it posted at briar press. “antique hamilton type cabinet” for $900. if anyone is interested, i’d love to find a home for it. Hi, I have a 48-drawer Hamilton type cabinet. It’s in good shape. We’re in Indiana though. I’d entertain offers if you’re willing to pick it up. Like many, I’ve listed it on Craigslist (for $1699) but it’s not moving. I’ve attached a pic, but have more. Let me know if you’re interested. Having trouble uploading a picture. Email me and I’ll fix you up with several.